adidas Originals introduced its latest collection by the name of the ‘Frank Shorter vs. The Imposter’ pack and it honors the iconic American athlete Frank Shorter. The story of his career was spotlighted by the 1972 Olympic Games, where he was in the lead before an imposter entered the stadium and ran into what’s recognized as a false victory. 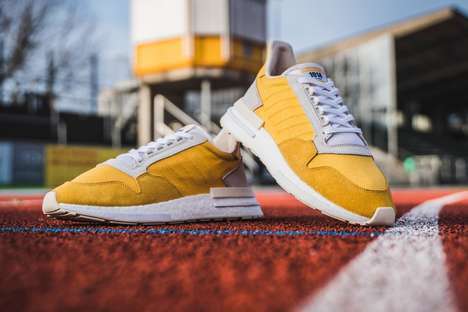 The pack features two designs including the ‘ZX 500 RM’ and the I-5923′ — the first arrives in a ‘Bold Gold’ colorway and the ladder in ‘Collegiate Royal.’ Additional details include the “1014| graphic on the tongue of the vibrant yellow iteration as a nod to the athlete’s original number. The uppers of the sneakers are constructed from a blend of mesh and suede materials and sit atop an enhanced cushioning foundation. The blue colorway is also constructed from a blend of suede and mesh with a BOOST midsole.